(Click to see a larger version) Is it a llama? No, it's a Quarter Horse stallion...presented just terribly. I am not sure if these people used to be into Arabs and simply did not get the memo that not all horses are posed alike, but everything about this picture screams "amateurs who don't know enough to be breeding or standing a stud." Let's start with the halter. It's nearly on his nostrils. If he pulled back, it would slide right off his nose. I found a fantastic halter fitting article in all of 30 seconds online by googling, so I am pretty sure the information is accessible on how to do this correctly. As Ms. Thorson correctly observes "If a dress or show halter is too big, too small, or fits sloppily, its purchase price is wasted because the impression left is the opposite of the one intended. The wearer might as well sport a sign saying, 'I spent good money to look like I don't know what I'm doing.'" Bingo! And that's exactly the impression a silvery show halter that nearly covers the horse's nostrils gives off. Then we have the feet. This is no abuse case, but these are the feet of a horse who is a month or two overdue. The problem with that is the long feet change everything about his legs. They give the impression that he his pasterns are long and weak, and I'm not sure that's the case. It looks to me like they are being forced backward by a super long toe, and that a good hoof trim would reveal legs that are pretty good. (He does look tied-in at first glance but look at the big picture - what you're seeing is sunlight shining on the back of the front leg and making it disappear). Then there's the pose. With one hind leg cocked, the impression I immediately get is that the horse is unsound. That may not be true, but the picture shows a horse who isn't putting any weight on that leg and a hoof that appears to be very different from the one on the other side. There's a reason we "square up" horses - because that pose most accurately shows off their conformation. It's not that hard to teach a horse to stand square. Then there's grooming or the lack thereof. This horse is in his winter coat, but even without clipping and blanketing, you can do a lot to create the illusion of a slick, shiny coat. A damp towel will remove surface dirt and dust, and then a show spray like Show Sheen or Laser Sheen will gloss them up nicely. Even in the cold, you can wash and pick out the tail so that it looks its best. The nicest thing I can say about this horse is that he isn't muddy. Finally, there's the angle this was shot at. As you can see, the photographer was higher than the horse. As a result, the horse looks like he has a longish back and stubby legs. 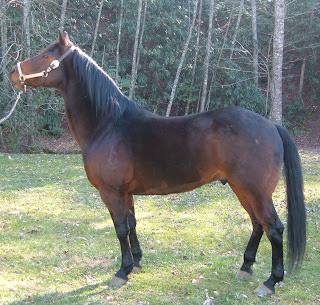 He's a foundation quarter horse - he kind of looks like that anyway, why make it worse? They know what they did, as they reduced their original pic from 1515px × 1443px to 302px × 337px. Um, proportion FAIL. The result is a squooshed version of the horse on their web page that looks like he has suffered an unfortunate accident. Not the way to show off your stallion at stud! Now, this is not such a bad little horse. If they would get off their butts and show him, I might even concede that he has a right to reproduce (I looked, no points). He's got some nice breeding. Of course, not a peep about his HERDA status on their web site and I'm scared they wouldn't know what it was if I asked them. But still, I like him better than a lot of FQHA stallions I've seen. It's a shame they are so clueless they're presenting him like a 5 year old presents her Shetland pony in the 4-H showmanship class. Actually that's probably unfair to the 5 year old...I know many who understand presentation better than these folks!